Move over, Scotty: Some real-life engineers and scientists are flocking to Houston this week to debate the future of interstellar space travel. Members of the public, industry professionals and academics have descended upon the Texas city for the third annual 100 Year Starship symposium, which will discuss what the world needs to do in the next 100 years to take starship technology out of the realm of science fiction and into reality. 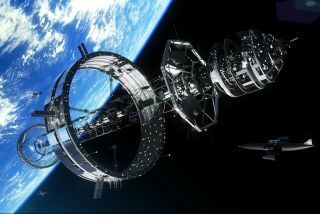 The symposium "seeks to highlight the small incremental steps as well as radical leaps required to make significant progress to interstellar space, and how those steps will yield important benefits to life on Earth," 100-Year Starship officials wrote in a release. The 2013 100 Year Starship symposium will feature presentations by the SETI (Search for Extraterrestrial Intelligence) Institute's Jill Tarter, former NASA astronaut and the first African-American woman in space Mae Jemison, astrophysicist Hakeem Oluseyi and an international group of 75 other speakers. About 160 people are expected to attend the conference. The symposium's reach is wide. Speakers will present papers on topics such as future propulsion systems, the ethics and cultural implications of interstellar space travel and the economics of sending human technology to distant stars. The conference also features an Earth-based focus. Some presenters will speak about "how these interstellar-driven innovations translate to help improve and enhance life here on Earth today and in the years to come," symposium officials said in a statement. Any interested member of the public can take part in the conference. Tickets to nighttime events — including a "Sci-Fi Night" that features a screening of the film "Europa Report" on Friday (Sept. 20) — are available for purchase. Space enthusiasts can also still register to attend daytime sessions. Another notable event hosted by the 100 Year Starship symposium will attempt to bridge the gap between art and interstellar science. "Saturday evening’s 'Accelerating Creativity' dinner features Bella Gaia, an amazing multimedia performance created and performed by Kenji Williams and company that interprets scientific data, actual space images and music to help us understand humanity’s connection and impact on Earth and with space," officials wrote. Visit SPACE.com this week for complete coverage of the conference. While the conference will not be webcast, 100 Year Starship officials will release video footage of the plenary sessions starting the last week in October.